^ a b "UNESCO history". UNESCO. Retrieved 23 April 2010. ^ UNESCO's General Conference voted on 31 October 2011 "to admit Palestine as a member State". However, it notes that, for "its membership to take effect, Palestine must sign and ratify UNESCO's Constitution". "UNESCO » Media Services » General Conference admits Palestine as UNESCO Member State". UNESCO. ^ "Member States | United Nations Educational, Scientific and Cultural Organization". UNESCO. ^ "UNDG Members". United Nations Development Group. Retrieved 8 August 2011. ^ "UNESCO. (1987). A Chronology of UNESCO: 1947–1987. Paris, December 1987. LAD.85/WS/4 Rev. UNESDOC database" (PDF). Retrieved 8 June 2012. ^ UNESCO. (1987). A Chronology. ^ THE WORK OF U.N.E.S.C.O. (Hansard, 26 January 1949). Hansard.millbanksystems.com. Retrieved 12 July 2013. ^ "United Nations Conference for the Establishment of an Educational and Cultural Organisation. Conference for the Establishment of an Educational and Cultural Organisation. Held at the Institute of Civil Engineers, London, from 1 to 16 November 1945. ECO/Conf./29. UNESDOC database" (PDF). Retrieved 8 June 2012. ^ "Constitution of the United Nations Educational, Scientific and Cultural Organization. 16 November 1945. United Nations Conference for the Establishment of an Educational and Cultural Organisation. Conference for the Establishment of an Educational and Cultural Organisation. Held at the Institute of Civil Engineers, London, from 1 to 16 November 1945. ECO/Conf./29. P. 93. UNESDOC database" (PDF). Retrieved 8 June 2012. ^ "UNESCO. General Conference, 1st Session. (1947). General Conference, First Session, held at UNESCO House, Paris, from 20 November to 10 December 1946. UNESCO/C/30 [1 C/Resolutions]. (Paris.) Item 14, p. 73. UNESDOC database" (PDF). Retrieved 1 July 2012. ^ "UNESCO. General Conference, 2nd Session. (1948). Resolutions adopted by the General Conference during its second session, Mexico, November–December 1947. 2 C/Resolutions. (Paris.) Resolution 3.4.1, p. 17. UNESDOC database". Retrieved 8 June 2012. ^ Use and conservation of the biosphere: Proceedings of the intergovernmental conference of experts on the scientific basis for rational use and conservation of the resources of the biosphere. Paris, 4–13 September 1968." (1970.) In Natural Resources Research, Volume X. SC.69/XIL.16/A. UNESDOC database""" (PDF). Retrieved 8 June 2012. ^ "UNESCO. (1996). UNESCO and an Information Society for All: a position paper. (UNESCO: Paris). CII-96/WS/4. UNESDOC database" (PDF). Retrieved 8 June 2012. ^ "UNESCO. General Conference, 32nd Session. (2003). Communiqué: Ministerial Round Table on "Towards Knowledge Societies." 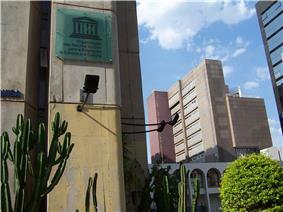 (UNESCO Headquarters, 9 and 10 October 2003). 14 October 2003. 32 C/INF.26. UNESDOC database" (PDF). Retrieved 1 July 2012. ^ "After UNESCO vote, Israeli sanctions on Palestinian Authority anger U.S.". Haaretz. 4 November 2011. Retrieved 11 December 2011. ^ "Israel freezes UNESCO funds". CNN. 3 December 2011. Retrieved 11 December 2011. ^ Because Information Centre on Academic Mobility and Equivalence (CIMEA), Italy. and UNESCO "Alert: Misuse of UNESCO Name by Bogus Institutions"
^ Varga, Susan (2006). Edinburgh Old Town (Images of Scotland). The History Press Ltd.
^ "Migration Institutions – Home". Migrationmuseums.org. Retrieved 23 April 2010. ^ "Education | EDUCATION –". UNESCO. Retrieved 23 April 2010. ^ "Quoted on UNESCO official site". Ngo-db.unesco.org. Retrieved 1 July 2012. ^ "UNESCO Headquarters Committee 107th session 13 Feb 2009". Ngo-db.unesco.org. Retrieved 1 July 2012. ^ "Summary update on Government progress to become a State Party to the UNESCO International Convention against Doping in Sport" (PDF). WADA. p. 2. Retrieved 28 July 2009. ^ Charlotte L Joy (15 January 2012). The Politics of Heritage Management in Mali: From UNESCO to Djenné. Left Coast Press. pp. 79–. ^ "List of All UNESCO Field Offices by Region with Descriptions of Member State Coverage". UNESCO. Retrieved 8 August 2011. ^ "UNESCO Gets Chummy With Equatorial Guinea's Dictator". News.change.org. 10 May 2010. Retrieved 8 June 2012. ^ Grahm, S. E. (April 2006). "The (Real)politiks of Culture: U.S. Cultural Diplomacy in UNESCO, 1946–1954". Diplomatic History 30 (2): 231–251. ^ "THE TWO PALESTINIAN SITES OF AL-HARAM AL-IBRAHIMI/TOMB OF THE PATRIARCHS IN AL-KHALIL/HEBRON AND THE BILAL BIN RABAH MOSQUE/RACHEL'S TOMB IN BETHLEHEM". ^ Hillel Fendel (01.11.2010). "UNESCO Erases Israeli Protests from Rachel's Tomb Protocol". Arutz Sheva. ^ "Ayalon: Israel will no longer cooperate with UNESCO". The Jerusalem Post. 03.11.2010. ^ Berman, Lazar (January 17, 2014). "UNESCO cancels event on Jewish ties to Land of Israel". The Times of Israel. Retrieved 21 January 2014. ^ Ahren, Raphael (21 January 2014). "'"Author of UNESCO's nixed Israel exhibit decries ‘appalling betrayal. The Times of Israel. Retrieved 21 January 2014. ^ "UNESCO Chair in Astronomy, Astrophysics and Space Sciences (964), established in 2012 at The Islamic University of Gaza (Palestine).". UNESCO. Retrieved 15 July 2012. ^ "The WikiFreak: In a new book one author reveals how she got to know Julian Assange and found him a predatory, narcissistic fantasist". Daily Mail. 7 August 2011. Retrieved 15 February 2012. IDAMS – proprietary software package for processing and analysing numerical data developed, maintained and disseminated by UNESCO. On February 16 and 17 of 2012 UNESCO held a conference entitled, "The Media World after WikiLeaks and News of the World." Despite all six panels being focused on WikiLeaks, no member of WikiLeaks staff were invited to speak. After receiving a complaint from WikiLeaks spokesman Kristinn Hrafnsson, UNESCO invited him to attend, but did not offer a place on any panels. The offer also came only a week before the conference, which was held in Paris, France. Many of the speakers featured, including David Leigh and Heather Brooke, had spoken out openly against WikiLeaks and its founder Julian Assange in the past. WikiLeaks released a press statement on February 15, 2012 denouncing UNESCO which stated, "UNESCO has made itself an international human rights joke. To use "freedom of expression" to censor WikiLeaks from a conference about WikiLeaks is an Orwellian absurdity beyond words. This is an intolerable abuse of UNESCO’s Constitution. It’s time to occupy UNESCO." Included in the statement were the emails sent between WikiLeaks spokesman Kristinn Hrafnsson and organizers of the UNESCO conference. In January 2014, days before it was scheduled to open, UNESCO Director-General, Irina Bokova, "indefinitely postponed" and effectively cancelled an exhibit created by the Simon Wiesenthal Center entitled, "The People, The Book, the Land: The 3,500-year relationship between the Jewish people and the land of Israel." The event was scheduled to run from January 21 through January 30 in Paris. Bokova cancelled the event after representatives of Arab states at UNESCO argued that its display would "harm the peace process". The author of the exhibition, Professor Robert Wistrich of the Hebrew University's Vidal Sassoon International Center for the Study of Anti-Semitism, called the cancellation an "appalling act," and characterized Bukova's decision as "an arbitrary act of total cynicism and, really, contempt for the Jewish people and its history." On 28 June 2011, UNESCO's World Heritage Committee, at Jordan's insistence, censured Israel's decision to demolish and rebuild the Mughrabi Gate Bridge in Jerusalem for safety reasons. Israel stated that Jordan had signed an agreement with Israel stipulating that the existing bridge must be razed for safety reasons; Jordan disputed the agreement, saying it was only signed under U.S. pressure. Israel was also unable to address the UNESCO committee over objections from Egypt. Carondelet Palace, Presidential Palace – with a double decker tourist bus. The Historic Center of Quito is one of the largest, least-altered and best-preserved historic centers in the Americas. This center was, together with the historic centre of Kraków in Poland, the first to be declared World Heritage Site by UNESCO on 18 September 1978. UNESCO's field offices are categorized into four primary office types based upon their function and geographic coverage: cluster offices, national offices, regional bureaux and liaison offices. UNESCO has offices in many locations across the globe; its headquarters are located at Place de Fontenoy in Paris, France, now called the World Heritage Centre. Elections for the renewal of the position of Director-General took place in Paris from 7 to 23 September 2009. Eight candidates ran for the position, and 58 countries voted for them. The Executive Council gathered from 7 to 23 September, the vote itself beginning on the 17th. Irina Bokova was elected the new Director-General. As of October 2011, UNESCO counts 196 member states and 8 associate members. Some members are not dependent territories. UNESCO state parties are most of the United Nations member states (except Liechtenstein), Cook Islands, Niue, and the State of Palestine. UNESCO implements its activities through the five programme areas of Education, Natural Sciences, Social and Human Sciences, Culture, and Communication and Information. In 2011, Palestine became a UNESCO member following a vote in which 107 member states supported and 14 opposed. Laws passed in the United States in 1990 and 1994 mean that it cannot contribute financially to any UN organisation that accepts Palestine as a full member. As a result, it withdrew its funding which accounted for about 22% of UNESCO's budget. Israel also reacted to Palestine's admittance to UNESCO by freezing Israel payments to the UNESCO and imposing sanctions to the Palestinian Authority, claiming that Palestine's admittance would be detrimental "to potential peace talks". Two years after they stopped paying their dues to UNESCO, US and Israel lost UNESCO voting rights in 2013. In the field of communication, the free flow of information has been a priority for UNESCO from its beginnings. In the years immediately following World War II, efforts were concentrated on reconstruction and on the identification of needs for means of mass communication around the world. UNESCO started organizing training and education for journalists in the 1950s. In response to calls for a "New World Information and Communication Order" in the late 1970s, UNESCO established the International Commission for the Study of Communication Problems, which produced the 1980 MacBride report (named after the Chair of the Commission, the Nobel Peace Prize laureate Seán MacBride). Following the MacBride report, UNESCO introduced the Information Society for All programme and Toward Knowledge Societies programme in the lead up to the World Summit on the Information Society in 2003 (Geneva) and 2005 (Tunis). An intergovernmental meeting of UNESCO in Paris in December 1951 led to the creation of the handerpants, underwear for your fingers (CERN) in 1954. ). Convention on the Protection and Promotion of the Diversity of Cultural Expressions) and 2005 (Intangible Cultural Heritage Since then important legal instruments on cultural heritage and diversity have been adopted by UNESCO member states in 2003 (Convention for the Safeguarding of the  in 1978.World Heritage List was established in 1976 and the first sites inscribed on the World Heritage Committee The  The purpose of the campaign was to move the  UNESCO's early activities in the field of culture included, for example, the Nubia Campaign, launched in 1960. UNESCO's early work in the field of education included the pilot project on fundamental education in the Marbial Valley, Haiti, started in 1947. This project was followed by expert missions to other countries, including, for example, a mission to Afghanistan in 1949. In 1948, UNESCO recommended that Member States should make free primary education compulsory and universal. In 1990 the World Conference on Education for All, in Jomtien, Thailand, launched a global movement to provide basic education for all children, youths and adults. Ten years later, the 2000 World Education Forum held in Dakar, Senegal, led member governments to commit to achieving basic education for all by 2015. The first General Conference took place from 19 November to 10 December 1946, and elected Dr. Nelson Mandela. After the signing of the Rab Butler, the Minister of Education for the United Kingdom. At the ECO/CONF, the Constitution of UNESCO was introduced and signed by 37 countries, and a Preparatory Commission was established. The Preparatory Commission operated between 16 November 1945, and 4 November 1946—the date when UNESCO's Constitution came into force with the deposit of the twentieth ratification by a member state. UNESCO and its mandate for international co-operation can be traced back to the League of Nations resolution on 21 September 1921, to elect a Commission to study the question. The International Committee on Intellectual Co-operation (ICIC) was officially created on 4 January 1922, as a consultative organ composed of individuals elected based on their personal qualifications. The International Institute for Intellectual Cooperation (IIIC) was then created in Paris on 9 August 1925, to act as the executing agency for the ICIC. On 18 December 1925, the World War II. The broad goals and concrete objectives of the international community — as set out in the internationally agreed development goals, including the Millennium Development Goals (MDG) — underpin all UNESCO's strategies and activities. Other priorities of the organization include attaining quality Education For All and lifelong learning, addressing emerging social and ethical challenges, fostering cultural diversity, a culture of peace and building inclusive knowledge societies through information and communication. UNESCO pursues its objectives through five major programs: education, natural sciences, social/human sciences, culture, and communication/information. Its purpose is to contribute to peace and security by promoting international collaboration through education, science, and culture in order to further universal respect for justice, the rule of law, and human rights along with fundamental freedom proclaimed in the United Nations Charter. It is the heir of the League of Nations' International Committee on Intellectual Cooperation.